Too Little, Too Late for Europe? It almost sounds like the European Union big chiefs are having one of those “What have I done?” moments. How many days ago did that train leave the station? EU honchos are trying to decide how to divvy up the horde of Muslims pouring in from northern Africa. Most of the member states, it seems, favor the position of “Your country must take more migrants: my country already has too many.” These disagreements are getting louder and sharper. Is it already too late? Has this experiment in open borders fatally damaged Europe? 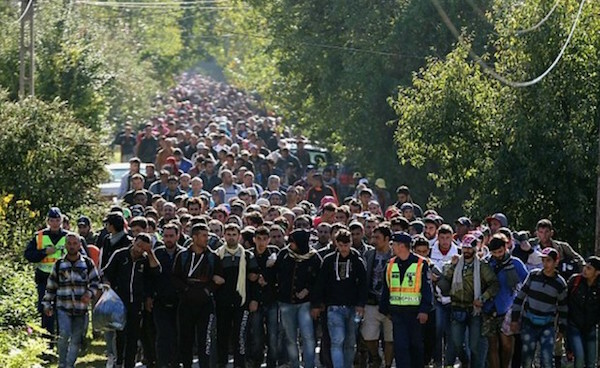 This entry was posted on Saturday, June 9th, 2018 at 11:12 am	and tagged with EU splitting over Muslim migrants, European Union, Muslims taking over Europe, saving Europe, too late for Europe? and posted in news. You can follow any responses to this entry through the RSS 2.0 feed. The same thing is happening here, and if the libs have their way, we’ll be a nation of illegals with no common customs or language – just sanctuary cities. Wait. I think we’re there already. To use one of their own favorite words, their project is economically (and morally) unsustainable. There seems to be a growing change of opinion in Europe regarding this. I have read stories about citizens in Italy, Hungary and Sweden voicing resistance to this immigration. The next months and years may prove interesting. Mark Steyn is convinced Europe is doomed based on birth statistics. Do the math; white people aren’t having enough babies and Muslim people are having plenty. That’s why the push for immigration, to keep up the socialistic system they have built.